تعنى هذه الحالة لطفل ادخل المستشفى أثر حادث بسيط وكان يعاني من شلل نصفي سفلي، ناتجاً عن ورم في الحبل الشوكي الظهري (أستروسايتوما). تشكل هذه الأورام ثلث أورام الحبل الشوكي ولكنها تختلف في كيفية ظهورها. ويعتبر الخلل العصبي الناتج عن حادث بسبب الأورام في الحبل الشوكي (أستروسايتوما) غير مألوف. توضح هذه الحالة مثالا هاما عن شلل نصفي ناتجا عن نزيف داخل الورم. An 18-month-old boy presented to our emergency service with acute onset of paraplegia following a minor traumatic event (falling from a Crip) and initial investigation was directed toward traumatic etiology where brain-computed tomography scan was essentially normal. 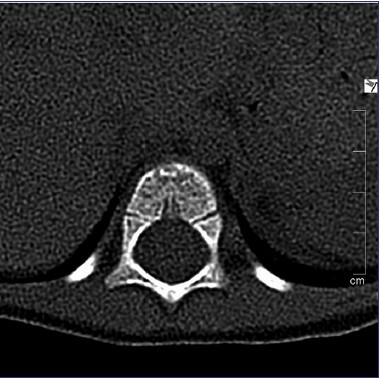 A cervical and dorsal computed tomography scan was performed (SIEMENS SYMPHONY AS. multi-detector scanner) and images were obtained in three orthogonal scans with a slice thickness of 2 mm and bone algorithm was used. The scan showed mild expansion of the spinal canal with effacement of spinal canal epidural fat at D11 and D12 levels with no associated fractures or mal alignment [Figure 1]. 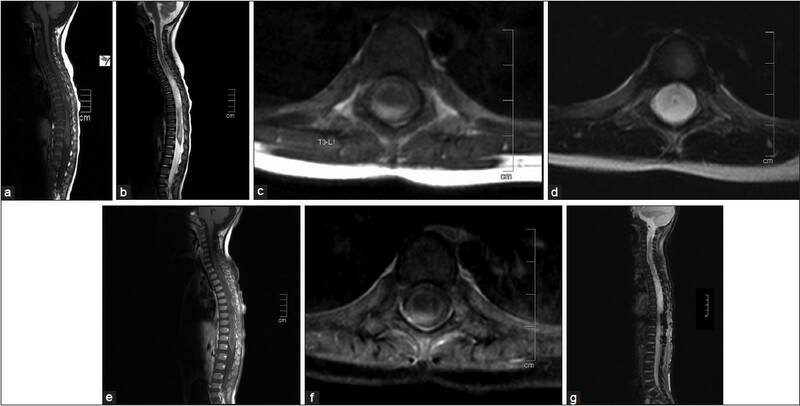 MRI of the thoracolumbar spine was obtained in sagittal T1 (TE14/TR406/SLICETHICKNESS 3MM), sagittal T2 (TE115/TR4000/ST3MM), axial T1WI (TE14/TR478/ST6MM), axial T2WI (TE147/TR4780/ST6MM), sagittal T1WI with fat suppression and intravenous contrast (TE10/TR511/ST3MM), axial TIWI with fat suppression and intravenous contrast (TE11/TR562/ST6MM) and sagittal gradient echo (TE18/TR600). The contrast used was Gadolinium based (MAGNEVIST. Dimeglumine gadopentetate, 469 mg, From Schering Pharma AG). The images were evaluated by three consultant radiologists (using SEIMENCE SYNGO. PLAZA-viewer and EIZO 5 megapixel color LCD monitor). The MRI showed a long segment thoracic spinal cord intra medullary mass lesion that involved D11 and D12 segments consecutively and measured 5.6 × 1.16 × 1.56 cm in cranio-caudal, antero-posterior, and transverse dimensions respectively. It showed low signal intensity in T1WI and increased heterogeneous signal intensity in T2WI with associated syrinx that reaches the D1 level [Figure 2]. Gradient echo images showed a blooming artifact and postcontrast administration showed a faint enhancement pattern with associated hemorrhagic components indicating hematomyelia. A cerebrospinal fluid analysis revealed xanthochromia, increased protein level, and red blood cell count. The patient underwent dorsal laminoplasty and resection of the intramedullary tumor. Pathological correlation revealed low-grade glial neoplasm formed of dense meshwork of fibrillary background and focal breakdown foci. Immunohistochemical studies were also performed and a diagnosis of low-grade astrocytoma was made. The patient was vitally stable but in flaccid paralysis till the discharge date and he was under antibiotic coverage along with steroids. Physiotherapy follow-up in an outpatient basis was arranged. A consent was obtained from the patient and permission from the ethical committee was obtained. This work was not supported by any funding agency and the authors have nothing to disclose. The aimed message from this case report is to keep clinicians aware of possible unusual presentations of spinal cord astrocytoma and to have a low threshold to perform further advanced imaging in cases of discordant medical history and clinical examination. 1. Koeller KK, Rosenblum RS, Morrison AL. Neoplasms of the spinal cord and filum terminale: Radiologic-pathologic correlation. Radiographics 2000;20:1721-49. 2. Chelcun JL, Pope RS. Spinal cord astrocytomas: Rare but life-threatening tumors in children. JAAPA 2009;22:37-41. 3. Huisman TA. Pediatric tumors of the spine. Cancer Imaging 2009;9:S45-8. 4. Smith AB, Soderlund KA, Rushing EJ, Smirniotopolous JG. Radiologic-pathologic correlation of pediatric and adolescent spinal neoplasms: Part 1, Intramedullary spinalneoplasms. AJR Am J Roentgenol 2012;198:34-43. 5. Seo HS, Kim JH, Lee DH, Lee YH, Suh SI, Kim SY, et al. Nonenhancing intramedullary astrocytomas and other MR imaging features: A retrospective study and systematic review. AJNR Am J Neuroradiol 2010;31:498-503. 6. Kawakami K, Kasai H, Yamada A, Numa Y, Sakai N, Kawamoto K. A case of spinal astrocytoma presenting spinal transverse sign due to hematomyelia. No Shinkei Geka 1995;23:327-31. 7. Alberdi J, Eiras J, Gomez J, Carcavilla L, Cantero J, Gimenez J. Sudden tetraplegia caused by hemorrhage in a central-medullary astrocytoma. Neurochirurgie 1987;33:62-5. 8. Benes V 3 rd , Barsa P, Benes V Jr, Suchomel P. Prognostic factors in intramedullary astrocytomas: A literature review. Eur Spine J 2009;18:1397-422.